Thoroughbreds are typically bred for speed, and often the question asked is “can they go the distance?” Can a horse stretch out from carrying their speed a few furlongs in morning workouts to a mile, 1 1/8 miles, 1 1/4 miles or more in a race? For a young gray filly named Casey's Lear, her races aren't measured by furlongs, but by miles. Together with her owner, Dixie Kendall (Hayes), “Steele” as she's known around the barn, is a budding endurance horse, and while Kendall has her sights set on some lofty long-term goals, every race – even an endurance race – begins with a single step. As a racehorse, “Steele” wasn't exactly breaking any land speed records. In her one and only race, she lagged behind her competitors early on and was distanced from the field before the horses had reached the halfway point in the 1 1/16-mile maiden claiming event. She was offered by Second Stride and adopted out, then was offered for sale. Kendall, who is the program coordinator and lead instructor at the North American Racing Academy, dabbled in endurance riding as a child and was looking to re-enter the sport with a Thoroughbred. “My entire background is in Thoroughbred racing, so that's why I wanted an off-track Thoroughbred for endurance racing. The breed is incredible and needs to be showcased for all of their abilities,” said Kendall. Endurance riding, which is sanctioned by the International Federation for Equestrian Sports (FEI) at the highest levels and by the American Endurance Ride Conference (AERC) at the local and national levels, is a sport based on long-distance races ranging from 13 miles at the introductory levels (called “limited distance” rides) to 100 miles at the elite levels, such as the World Equestrian Games and Tevis Cup. Endurance rides are typically held in parks, open land and other settings with various types of uneven, raw terrain. As such, much of an endurance horse's training centers around trail riding and navigating obstacles one might encounter on the trail or in the wilderness. In addition to trail riding and natural horsemanship, Kendall has also been working to put a dressage foundation on Steele in an effort to encourage her to soften and use her body in the most efficient way possible while on distance rides. While any breed of horse can compete in endurance races, the Arabian is most commonly used at the upper levels of the sport. Kendall, however, is eager to see and to show what her Thoroughbred can do. Horses must be a certain age to begin working up the levels (distances) in endurance riding. A horse must be a minimum of 48 months of age to compete in an intro (10-15 miles) or limited distance (30 miles) ride, 60 months to compete in a 50-mile ride and 72 months to compete in a 100-mile ride. With her birthday being March 6, 2014, Steele is 52 months old and just recently completed her first intro endurance trip, which was 13 miles, on June 23 at the Backstep Boogie Endurance Ride. In preparation for the longer rides, Kendall has been teaching Steele to snack on command while out on the trail, which may sometimes be easier said than done. “An important part of endurance riding is the vet checks and gut sounds are typically a factor for horses at the mid-point checks,” said Kendall, who explained that veterinary inspections are done prior to competition, at the mid-point of the ride and post-competition. Kendall says her short term goal is simply to keep her horse happy and sound so she can build a foundation of endurance for not only longer-distanced races but also for longevity awards offered by the AERC. 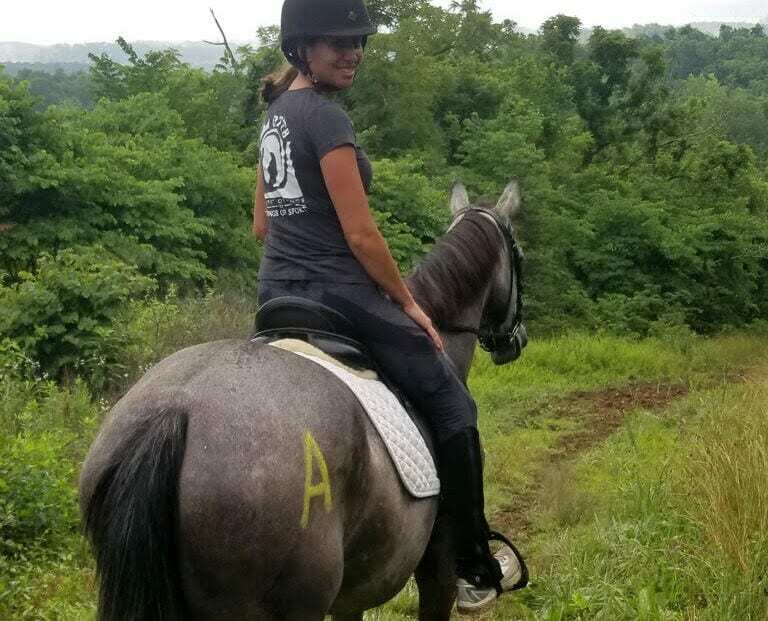 This entry was posted in Aftercare Spotlight, Horse Care, NL List and tagged Aftercare Spotlight, Cosequin Presents Aftercare Spotlight, Dixie Kendall, endurance races, endurance rides, Jen Roytz, Thoroughbred aftercare by Jen Roytz. Bookmark the permalink.